For someone who grew up in South India, which has more of a tropical climate with not much change in the weather pattern, and has only two seasons which is visible – Monsoon with the harsh rainy days, and summer with the harsh sunny days. So when I used to look at the printed day calendar hanging in the wall at different homes and, shops(imagine the days when there were no computers/internet/smartphones/phablets/tablets,) portraying pictures of scenery with beautiful fall colors, I used to think it is somewhere in a far away land, or maybe heaven, where only the few lucky ones including the photographer, who took the pictures, and the gods ventured. So one can imagine, if I say the fall season is truly magical for me every year, and the 3 to 4 weeks of fall foliage is something I do not miss out for the past 15 years of my living in US. Marry a sweet heart, and you are filled with ever blossoming romance this time of the year, when you go on a trip, and see the fall colors, which has been happening to me for the past 12 years. I have gone every year to see the fall foliage to different places usually around Connecticut and upstate NY. This year presented me with a different opportunity i.e explore Fish Creek in Wisconsin, and also cover one more state as part of my project 50 states. Fish Creek has Peninsula state park with its Eagle tower to view the fall colors across the woods of Peninsula state park. It also provides one with photographic opportunity to capture the heavenly hue spread across acres of the park with Lake Michigan providing a perfect contrast. We booked a room at Parkwood lodge, a small family friendly hotel with a kitchenette attached, two weeks prior, for the first weekend of October, as we realized we are running out of accommodations. My research suggested that the fall colors are at the peak during the last week of Sept, and the first week of Oct. So I picked the first weekend of Oct, but when I checked the fall report (http://www.travelwisconsin.com/fall-color-report?new=1) it showed 50% fall foliage in Door county due to a two weeks of warm weather between the last week of Sept, and first week of Oct. I was little disappointed though there was no other option to postpone the trip, and we proceeded with the plans. It was a short weekend, and we planned for a tight itinerary. We drove to Door County from Cedar Rapids, IA, a 7 hr drive north on a friday evening. While driving, I realized that these are mostly inner roads though the average speed was around 55-60 miles per hour. The interesting fact, I noticed, driving around Mid-west is the lack of stress in driving probably due to less traffic compared to East Coast where even a 3 hour drive can be tiring in all those traffic near New York, or Boston, or Washington DC, or Philadelphia, depending upon where you are driving. We checked in to the hotel and saw the room was clean though I could sense that the room was not rented out for a long time with the musty smell emanating. It was raining the next day, but we caught up with our breakfast, and drove around Peninsula State Park. The park has an entrance fee of $10 for vehicles with out of state license plate per day, and $5 for Wisconsin license plates. Though it was raining, we were able to magnificent mix of colors from green to red spread across acres of the park with the Strawberry Island and Horseshoe island in the background sitting on Lake Michigan. Sven’s bluff in Skyline drive in Peninsula state park offer the best panoramic view while Eagle Tower provides a wide area of coverage. After 2 hours, we drove up north to Newport State park and we came across even more gorgeous fall colors. The drive up north in route 42 was spectacular with the winding roads with the trees with changing colors on both sides completing the scenic drive. As it was raining we were advised not to hike in Newport state park as the trails were slippery and so we eschewed any idea of hiking and came back to Fish Creek in the evening and caught up with the lunch/dinner at Cooper’s Corner in downtown Fishcreek. We saw the restaurant was crowded and though the food was good, we were not impressed much. We had a early start on Sunday morning, caught up with breakfast at the Arroyo Bay Grill which was not crowded as we expected and headed to Peninsula State Park again to check out the places we ear marked for revisit – Sven’s Bluff, Nicolete beach and Eagle’s Bluff and then we headed back to Cedar Rapids, IA. As we drove in the route 42 south, we came across kite flying and cheese/wine tasting places in Door county, which visitors can add to the list of places to visit if they are in for a longer visit unlike us. 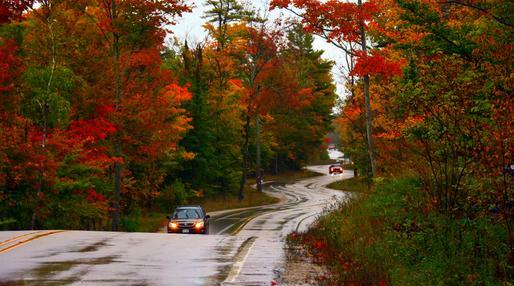 Drive up north along route 42 to Newport state park and you can see gorgeous fall colors. One of the awesome sights on the way to Newport state park is the winding road with the trees with colors on both sides make it an awesome sight. Stay – Parkwood Lodge – $140 per night – was clean but certain amenities like lack of hair dryer (may not sound important to few but when your wife complains, you have to take notice 🙂 ). Do note that the hotels fill up quickly for the weekend around this time of the year. beautiful photos and nice narrative.